Our newspaper The Gulf News has a magazine called Friday which we get every Friday’s[obviously;-P]. 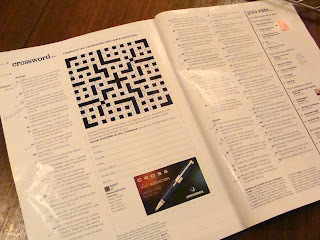 There are 2 competitions in the magazine which I religiously take part in every week. One is a quiz on books and the other a crossword puzzle. I've won the quiz many times and now Nikita has taken over that leaving me to concentrate on the crossword. I enjoy solving it and my love for trivia is gratified at same time;-). Earlier the crossword used to take me atleast 2 days to complete but now I’ve gotten better at it…ermm gotten better at getting the answers from the net is more like it;-P.
There are atleast 50 correct entries every week and my name figures in the list most of the time but only 1 lucky winner wins a Cross Pen, which I'm determined to win atleast once...actually twice, one for my sister and one for me;-D.
The above picture is my submission for this week. Advanced congratulations on your win, N!! I am sure you will!! A big Thank U in advance;-D.
Please also post a pic of the Cross Pen. Because you are going to win that anyway. Nope...H thinks the blue colour is too flashy;-/..and anyways he's already got one....a dull boring one;-D.
I want you to win. Cross my heart! U knw I've been participating in it for 6 months now....slowly losing hope...only the fact that I have won the quiz many times is keeping me going;-P.
Thanks for the vote of confidence:-)!!!! Aw you geek! The pen will be yours soon. Kaafi bada puzzle hai! And i also feel u have such a geeky side to u, puzzles et al! I remember ur picture puzzle wala post! Initially it used to take me upto 2 days to do it but now if I sit put I can finish it in 1 hour;-D.
Errr....can I see that pen please?